As soon as possible. I will personaly monitor your wallet and notify you when we do a payout to your address. We have to payout the exact amount to every one, you warnier included. we need to go through entire database, check every line, assemble and recalculate, then payout, this is awsome amount of work, takes time we dont have, and could spend to improve new pool, but as promised shall be done. As I said in previous posts manual payouts were our last option. Thanks for your patience. Comment are always appreciated. Soon my miners go back to you pool....I hope this will be appreciated by you and an incentive to send as soon possible my eth of last block of old pool. Yes, I can see your wallet address at our pool mining so I wish to thank you for staying at our pool and your trust in us. We appreciate this! Can you please confirm you received your payment we sent for your mining. You should have two payments by now because you joined again just in time to mine a part of new block on pool. We work to make this worth for everyone at pool. If you need any help please dont hasitate to ask! Happy mining! I confirm. I received 4.5 eth for the old block. Thank you man and excuse my distrust. Good pool and good staff. 1. Its better to mine solo or use a pool instead? 2. Can I conect to a pool only with a R9 280x? 3. What kind of software do I need to start mining using etermine.rocks? 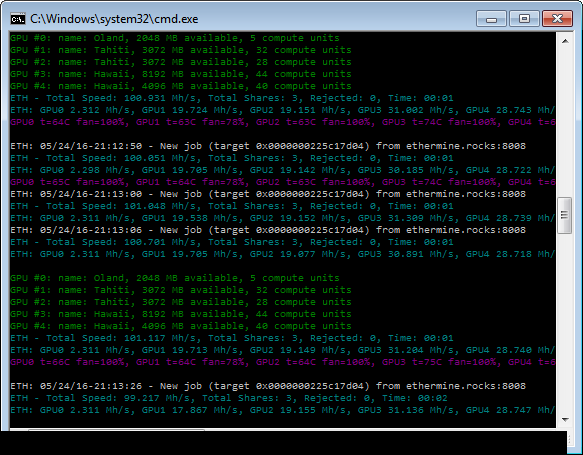 @ethermine_rocks can i use the claymores's miner? and i would like to use ubuntu 16.04, just for stability in the system. I can't stay all day watching the process. Is that good? Hi @ethermine_rocks how can I use Claaymore miner? Maybe do you have a hint for me? Well for a small pool I think we can all feel satisfied, today most miners made around 5 ETH mining on pool. Happy mining folks! Ubuntu 16.04 is without fgrlx, if you can do mining let me know. Or just restart claymore to connect again. Tnx. @ethermine_rocks how do I monitor my miner on your pool? Would like to see average Hash rate, shares, etc. can't see it anywhere on your site. started mining with you but I'm wondering why my hashrate says 104 (long average) while on Claymore miner I'm consistantly doing 29.8 per card x4 .... should be close to 120. Been mining for 10 hours so far ... Is that normal? also, is it best to put all miners on the same address or have 2 separate workers, each with a different address? I've seen many combine them. Yep, hashrate varies, so your long average is just that, average speed in a period longer than 3hours, you will probably see it peak a lot above 120 at times. It's normal. i see you changed software. now it resembles poolto but is called open instead of go.